The circular economy is even further increasing the process of converting waste materials in to re-usable base material. The end-goal is to have zero waste and 100% re-use of materials. Recycling of timber/wood waste for biomass, household waste and bottom ash is a process which can cause dust emission resulting in eye, nose and throat irritation, allergies and long-term effects such as asthma and lung diseases. Dust emission can travel for miles and possibly effect the recycling sites’ direct surrounding and community. Bottom ash is especially notorious to deal with, as it contains almost no organic matter and therefore hardly absorbs any water. 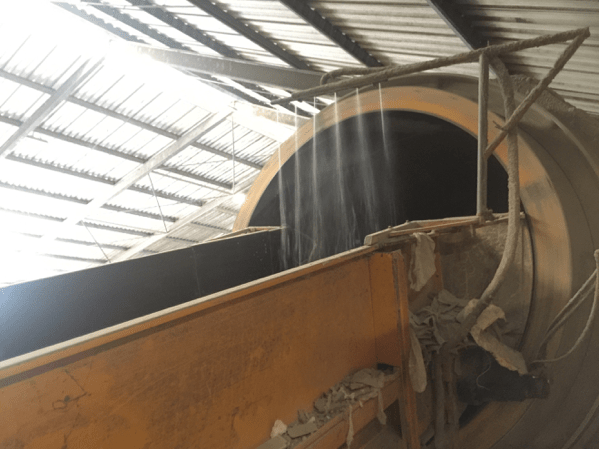 Wuvio’s wetting agent significantly reduces the amount of water needed in atomizing and fog systems, these systems can be used to cover the entire hall or certain location at critical conveyor belts or transfer points. Foaming is a technique used for inline treatment with increased active duration up to 30 days, which allows for minimized water usage and moisture levels. Applies with compressed air a very dry and thick foam curtain can be created.